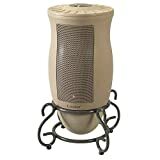 Heaters come in all shapes and sizes and can be either indoor or outdoor heaters. We understand that trying to choose a space heater can cause a lot of confusion and it is easy to get all heated up when trying to decide. That is because the possibilities are endless, what with different running costs, heating systems, sizes, price and in some cases location specifics, such as garage heaters. To help you make sense of all the information and make a quick informed decision, we have put together this shopping guide that will have you warm and snug in no time at all. Gas Heaters: Gas heaters are open flame heaters that are good for well-ventilated areas. 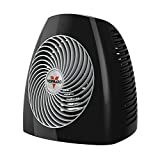 There are two types of gas heaters that fall into the space heater category - propane gas heaters, which heat big areas for long periods of time, and kerosene gas heaters, which use wicks to burn kerosene. Gas heaters suit garages or can be used indoors as an alternative if your power goes out. Ceramic Heaters: These are perfect for small rooms like an office or craft room. The internal fan blows air over a heated ceramic element, and can be easily directed at the area you want to be warm. Ceramic heaters are cool to the touch, making them a safer option when you have kids in the house. Infrared (or Radiant) Heaters: The infrared technology of these heaters does not heat the air around them, but rather the people and surrounding objects. They work well in smaller apartments and are efficient units that heat up quickly. Perfect for dorm rooms, home offices or craft rooms. Panel or Micathermic (Mica) Heaters: These combine convection and infrared technology to create even heat around the room. In mica heaters, the heating element is encased within several sheets of mica (a type of heat-conducting stone) that forms the panel. Eco wall-mounted panel heaters use a lot less electricity. 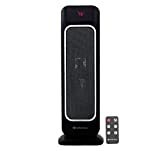 Standing panel heaters heat up almost immediately and are great for large rooms. 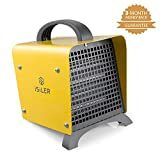 Travel (or Portable) Heaters: These are small heaters that are mobile enough for taking on vacation or for added heat in a small area. They are either fan, infrared or convection heaters that are designed to be small, light and portable. Great for the RV or under a desk to heat your toes while you work. Garage Heaters: Garage heaters are mounted to the wall or ceiling and are placed near work areas to direct heat at the object or people that needs warming. They can heat areas up to 560 square feet and require 240 volt power and therefore cannot be plugged into a standard power outlet. Ranging between 1500 and 5600 watts, they can heat various size workshops depending on your heating needs. Oil Heaters: These heaters use special heat-conserving oil that is circulated over coils to heat the space surrounding it. The oil in oil heaters never has to be replaced, making them durable and long lasting. And as they make virtually no sound at all, they are great for bedrooms. Fan Heaters: These are lightweight travel heaters that blow hot hair. They heat up quickly and are a perfect addition to a small room on those extra cold days. Some of them come with ‘cool’ settings that can be used as a fan in warmer weather. Convection Heaters: After the heating elements in convection heaters heat up, they warm the air around them. They emit heat for several hours, providing enough heat to keep the whole family cozy on those cold nights. Warm air lingers, even when the heater has been turned off, which makes them more cost effective to run. Operation noise: Heaters that are virtually silent are a lot more popular than those that aren’t, and get reviewed much higher. When it comes to quiet operation, panel and oil heaters are the quieter choice and should be considered if noise is an important factor for you. 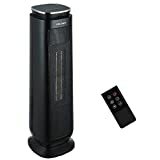 Settings: Adjustable temperature changes and a timer are the two most important considerations for space heater owners. Heaters that offer temperature settings mean you can dial your heater up or down and therefore use less electricity on the warmer days. 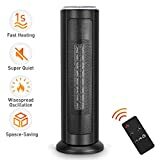 Heaters with timers are hugely popular as this allows users to set the heater to go on and off when desired instead of it being left on all night. Both these features will save you dollars in the long run! 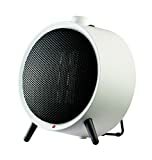 Heat: Space heaters that are quick to heat up and quick to heat the room get much better reviews than those who don’t. A fast heater will mean less running time which will save you on running costs. Safety: Safety is a huge concern for users. People with kids and pets need heaters to be cool to the touch in case of accidental touch, and ceramic heaters offer the best solution. Owners also value heaters that are safe to knock over or do not cause havoc if accidentally covered. If this is also a concern for you, look for safety features that switch off the heater when it is accidentally knocked over. 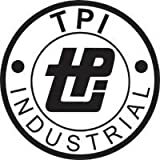 For more peace of mind, make sure the electric heater you buy has a label from a laboratory that is recognized, such as UL (Underwriters Laboratory), ETL (Intertek) or CSA (Canadian Standards Association). This will ensure that the heater meets voluntary U.S safety standards. All heaters should include a sensor that shuts it off automatically if it overheats, but for added safety, a heater that includes an automatic switch off if the heater tips over is a safe buy. Especially if you have kids and pets! When deciding on your heater, think of the area that needs to be heated and the number of people who will need to be kept warm. Small fan heaters offer a quick solution in a small room, while convection heaters will warm a large room with your whole family in it. Want that fireplace feel? Large, infrared heaters that are made to look like wood and have an electric flame display will give you the fiery glow and ambiance without the mess and smell. Ceramic heaters are quick to heat, and some oscillate from side to side to make sure all the corners of your room are kept nice and toasty. To make sure you have more options, look for a heater that has adjustable temperature settings. This will allow you to set it on high, medium or low depending on your comfort level, and switching it lower on those slightly warmer evenings will save you on electricity usage. Most heaters are easier on the ear than air conditioners, but noise does vary between types and makes. If you are more sensitive to noise or a light sleeper, go for the quieter oil or panel options. If you are looking for heating that is out of sight and out of mind, then a wall mounted panel heater is for you. A lot of these can be painted to match the colour of your walls, and, as a bonus, use much less electricity. Size matters! Portable travel heaters are perfect for storing under the desk when the study has an extra chill or for taking with you on a weekend away. For large rooms however, you will need a large unit. Also consider the weight if you are going to be moving the heater to and from various rooms in the house which would mean the lighter the better. Don’t forget cord length! A longer cord will give you more options in terms of where the heater can go and will save you the hassle of having to use an extension cord. When using your high setting on your heater, it is always advised to switch off lights and other appliances that are connected on the same circuit, to avoid tripping a circuit or blowing a fuse. 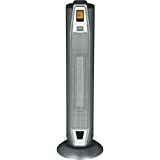 Electric space heaters are normally between 900 and 1500 watts, which are perfect for varying room sizes. Higher watts will heat larger spaces. Garage heaters can be up to 4000 watts as they are specifically designed to heat large work areas. Gas heaters are measured in BTU and can be between 10,000 and 40,000 Btu. The higher the number, the more heat your unit will produce. Propane and kerosene gas heaters are specifically designed for screened-in porches and outdoor areas and are considered dangerous for everyday indoor use. But keeping one on hand could help in an emergency power outage situation during winter. Lasko: Henry Lasko founded Lasko Metal Products in Philadelphia in 1906. In the mid-1900s, Lasko expanded their offerings to include small appliances, fans and household portable heaters. 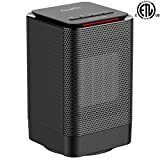 De’Longhi: De’Longhi, an Italian small appliance manufacturer including quality space heaters, was founded by the De’ Longhi family in 1902 and is run by the family still today. Econo-Heat: Rod and Russell Davis, father and son inventors from Cape Town, South Africa, invented the original Wall Panel Heater in 1990. Crane USA: Since 2005, Crane USA has made it their mission to put the fun back into humidifiers, air purifiers, and space heaters.